After using the Harbor Freight wheel of a few weeks I was very unhappy with the quality. And the worst thing of all, the rubber on the wheels is starting to form a flat spot when the table is at rest. So I went to ebay to find some higher quality caster wheels. I ended up getting something outside of ebay by contacting the seller directly. 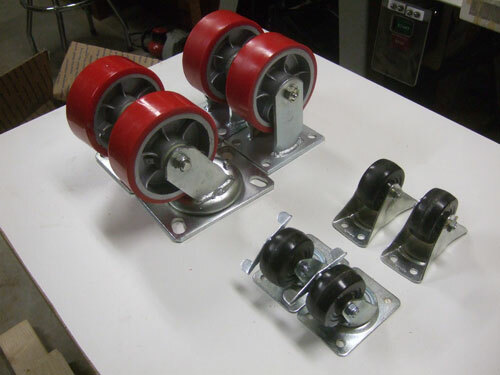 I got two set of wheels for $100 shipped, it is not a killer deal but consider the priority shipping cost $30, that is not too bad for wheels that can support 1500lbs. I already returned the Harbor Freight wheels but the black wheels below are the original wheels I had. The black wheels I had from a previous project worked but was squeaking very loudly because it does not have any bushing or bearings for the wheels. 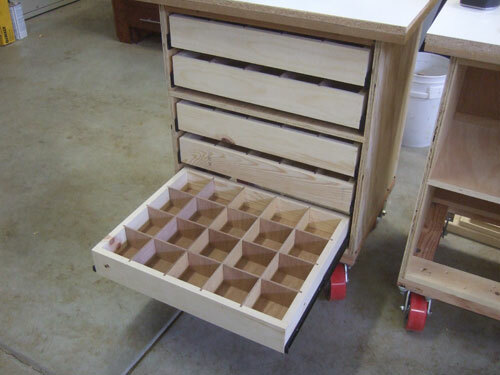 The picture below is how the mobile tool stand looks like when all the drawers are installed.